As I sat on my deck with a hot cup of coffee this morning, admiring the golds and reds taking over the backyard landscape, I found myself both entertained and intrigued by the squirrels scampering from shrub to shrub and tree to tree. I knew they were getting ready for winter, but I’d never given much thought to their ability to find their way around. I looked down at my phone, pondering the red line looping messily around the map neatly displayed on the screen. The tracking app allowed me to see exactly where I’d been during a hike the evening before, and it would enable me to go back along the exact path if I had a need to do so. The squirrels have no such map, I thought. Or do they? Animal navigation has piqued the interest of scientists across many disciplines — from physics to neuroscience — for decades. Navigation is, after all, essential for all animals’ survival, including humans’. Today we have a wide range of technologically advanced tools that direct us how to get from place to place, whether we’re walking, driving or even flying. But, what if we didn’t? As part of a University Air Squadron about 10 years ago, Louise Shirley was training to be a pilot when she and fellow members of her squadron had an opportunity to fly above the Amazon jungle. There, they witnessed a local tribe navigating the land with perfect precision without instruments. As she considered the contrast of the tribe’s ways to the panel of information displayed within the Grob Tutor, a small fixed-wing airplane, Louise was inspired and her interest in natural navigation was sparked. Her interest in the subject came to fruition over the past year. 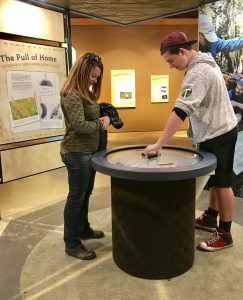 As Donald M. Kerr curator of natural history at the High Desert Museum, Louise dedicated herself to researching animal navigation and migration, talking to scientists from around the world and developing an interactive exhibit for the Museum’s visitors. But it’s not just the long-distance migratory species that need to find their way, Louise explained. It’s also the chickadee that needs to cache its seeds and recover them later. It’s the wolf that roams its territory. It’s the dung beetle that needs to quickly roll its fresh dung ball home to feed its family. The resulting exhibition, Animal Journeys: Navigating in Nature, investigates the internal mechanisms and biological forms of maps and compasses used by animals to find their way in the world and explores the techniques scientists are implementing to unravel these mysterious phenomena. It also shares insight into human impact on animals’ ability to navigate — such as how light pollution can obscure the night sky and completely disorient birds and other species — and offers ideas for effective conservation. And reflecting back on Louise’s initial inspiration, the exhibit examines how humans can read the landscape to navigate solely with natural cues. While there have been many major breakthroughs in scientific understanding — such as the discovery that dung beetles use the Milky Way for orientation in order to move in a straight line — much is still unknown. “It’s an incredible experience exploring the research and findings of scientists worldwide; so much is still being discovered. This is truly cutting-edge science,” Louise said. Like many scientific studies, the implications of understanding natural navigation are far-reaching. The answers hold potential for medical advancement, Louise said. For example, brain mapping of species such as bats and rats can lead to a deeper understanding of the brain’s spatial mapping, which in turn could lend insight into human dementia. 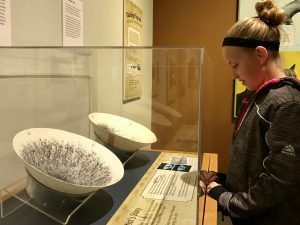 “My hope is that visitors come away from Animal Journeys in awe of the natural world and its intricacies, and with an understanding and appreciation of the value of science,” Louise said. With the last dregs of coffee cold in my cup, the squirrels still busy with their coming and going, I resolved to skip tracking my next hike with my phone, inspired to use the landscape and the endless natural cues to find my way, to embark on my own animal journey. 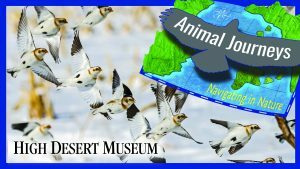 During your next visit to the High Desert Museum, be sure to spend some time exploring Animal Journeys: Navigating in Nature. Hopefully you, too, will be inspired. 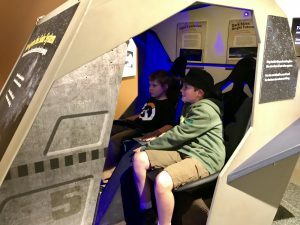 The exhibition runs through July 14, 2019 and is made possible with support from The Bulletin, Horizon Broadcasting Group and the James F. and Marion L. Miller Foundation.